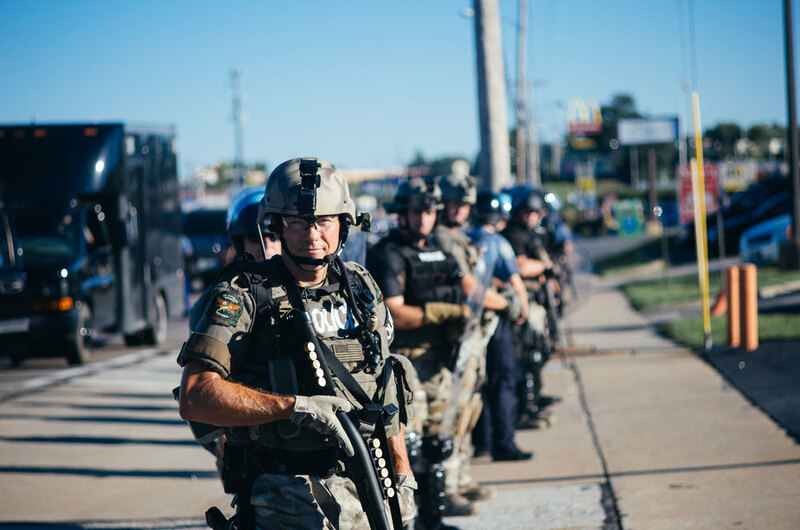 Police in Ferguson, MO. Photo by Jamelle Bouie. On Monday, October 30, 1961, Laurie Pritchett stood before a room of powerful but panicking segregationists. The city commissioners of Albany, Georgia, had gathered for an emergency session to discuss imminent assaults from two groups of despised outsiders: the federal government and the Freedom Riders. In just two days, new federal regulations would take effect to prohibit official segregation in interstate travel facilities like Albany’s train station. Rumor spread that a group of young protesters planned to test Albany’s compliance with the new rules. With the weight of the law no longer on their side, the commissioners turned to Pritchett, their Chief of Police, seeking a new strategy to prevent racial integration. Just shy of his 35th birthday, Pritchett remained a commanding presence more than a decade after his stint as a scholarship lineman for the Georgia Bulldogs. Though relatively unknown, he would soon become, in the words of one New York Times reporter, “perhaps the worst enemy that the civil rights movement ever encountered.” Relishing his role as comforter, Pritchett assured the commissioners they need not worry about outside agitators. In the months that followed, Pritchett’s strategy to undermine protesters would rely on White Americans’ need to believe in their own innocence, as well as on their distaste for Black protest. Today, his plan echoes eerily in law enforcement responses to the growing Black Lives Matter movement. The example of Pritchett is especially instructive because the White attitudes he leveraged against Black protest in 1961 remain ripe for exploitation in 2016. In one respect, Farmer was proved right. White attacks on the Freedom Riders throughout Alabama did indeed sour public opinion on segregation. A national opinion poll conducted in May 1961, at the height of the Freedom Rides’ media coverage, found that two thirds of Americans supported the Supreme Court decision banning segregation in interstate travel. However, the same poll suggested widespread disapproval of the Freedom Riders’ provocative tactics. Even as the protestors endured brutal white supremacist violence, only 24 percent of Americans approved of their campaign, while 64 percent disapproved. Many Americans claimed to support racial equality but could not stomach such bold confrontation, including one “White leader” who scolded the Freedom Riders in The New York Times for "baiting" White Southerners into violence. Pritchett sought media coverage that would place responsibility for any conflict on the shoulders of protesters, rather than the authors and enforcers of the segregation laws. To do this, his officers needed to resist any temptation to meet peaceful protests with Alabama-style brutality. Over several months, Albany police arrested protesters at astronomical rates and quietly shuttled them to jails across southwest Georgia. To avoid spectacle and pay lip service to the new regulations integrating Albany’s rail station, Pritchett’s force cited protesters with vague and mundane infractions—disorderly conduct, failure to obey an officer, obstructing the flow of traffic. These low profile arrests stymied protesters’ ability to gain media traction, preserving local segregation without explicitly defending it. Days later, the New York Times published a glowing profile of Pritchett. He presented himself as above the fray, a neutral public servant concerned solely with maintaining order while others squabbled. “It’s not a matter of whether I’m a segregationist or an integrationist,” Pritchett declared. “You can’t have personal interests while you’re dealing with a situation like this.” Such a steady, civil image appealed to White Americans’ belief that riotous Black protesters and reactionary segregationists were two sides of the same trouble-making coin. The next month, however, Pritchett let his veneer of neutrality slip. He crowed to the Albany Herald that the civil rights movement had been set back “at least a decade” by its failure to win concessions from Albany. Unlike Pritchett, the police in Ferguson, Missouri never saw the protesters coming. The small St. Louis suburb had not seen a single homicide in 2014—until August 9th. That afternoon, police officer Darren Wilson fired six bullets into Michael Brown, an unarmed Black teen due to start college classes in just two days. For years, tensions had run high between Ferguson’s Black community and its overwhelmingly White police department. Black residents, who make up two-thirds of the town’s population, accounted for 93 percent of arrests made from 2012 to 2014. Moreover, Ferguson police had been targeting Blacks for traffic stops to generate revenue for the township government. Neighbors quickly gathered on the street where Brown’s body lay for hours under the hot summer sun. As more residents arrived, the Ferguson Police Department sent additional officers and police dogs to control the crowd. Afternoon faded into evening, and observers around the world began comparing the scene to the civil rights standoffs of a previous generation. Over the next four days, hundreds of protesters would take to Ferguson’s streets, while local law enforcement escalated conflict at each stage. At first, the confrontational tactics of the police bore little resemblance to 1961 Albany, recalling instead the more aggressive Alabama lawmen whose methods Laurie Pritchett sought to avoid. Later, attempting to reverse this course, Ferguson police would adopt a media-savvy blend of sympathy and order that closely resembled Pritchett’s calculated response to the Freedom Riders. This approach would be emulated by police departments elsewhere, as Black Lives Matter protests gained traction nation-wide. The evening after Michael Brown was shot, Ferguson police in riot gear brought dogs to face hundreds of people who had gathered for a vigil with the Brown family. The night quickly devolved into chaos, and when the smoke cleared, several local businesses had been looted and a convenience store destroyed by arson. Police made 32 arrests. The next day, Monday, 100 officers squared off with protesters chanting “Don’t Shoot!” and raising their hands in the air. Police ended the hour-long standoff by unloading tear gas and rubber bullets into the crowd. Meanwhile, a local television news crew took pains to remind its viewers that “obviously police aren’t out here to hurt anybody; they’re out here protecting the public.” But within hours, their cameras showed the small-town police department aiming high-tech military weapons at its own residents. One young officer, outfitted in head-to-toe military fatigues, stalked through an empty street, aiming his rifle into neighbors’ yards. On Tuesday, Ferguson Police Chief Tom Jackson reneged on a promise to reveal the name of the officer who killed Brown. On Wednesday, Ferguson officers arrested reporters at a local McDonald’s and shot tear-gas at an al Jazeera crew on live television. Then, after days of tone-deaf blunders by local police, Governor Jay Nixon announced an abrupt shift: The Missouri State Highway Patrol would take charge of security in Ferguson, under the command of Captain Ronald Johnson. Johnson’s interactions with protesters and reporters during this moment foreshadowed two police approaches that have been widely deployed since August 2014, especially in response to Black Lives Matter protests. On one hand, police departments strive to show measured sympathy for the Black communities they often criminalize or neglect in other contexts. On the other hand, police departments portray widespread criticism of policing—especially the protests themselves—as dangerous threats to public order. These two tactics align with Laurie Pritchett’s central aim—providing cover for police, elected officials, and the broader public to ignore their own culpability in Black suffering. Putting forward a sympathetic face distracts from protesters’ grievances. Portraying protesters as inexorably prone to violence disqualifies their critiques, placing them outside the boundaries of acceptable discourse. Together, these tactics let White observers avoid reckoning with broad social responsibility for racial inequity. In one display of Pritchett- and Johnson-like outreach, the Nashville Police Department served hot chocolate to protesters who had shut down an interstate highway. Coverage in local media focused on the officers’ orderly kindness toward the protesters, while barely considering the reasons behind the highway occupation. One of the contentions of the Black Lives Matter movement is that police “order” often functions as violent disorder in Black communities. In response, police have engineered demonstrations of friendly civility in Ferguson, Nashville, and beyond not only to defuse tense standoffs, but also to subvert claims about the malicious effects of police control. In so doing, departments echo Pritchett’s calculated positioning of police officers as neutral facilitators of public dialogue. Alongside these departmental efforts, police unions across the country have waged a campaign to attack protesters’ legitimacy. Rhetorically positioning law enforcement as both heroic and victimized, they cast the protesters as a public menace. Especially after the murder of two New York City police officers in December 2014, union officials have portrayed Black Lives Matter protesters as fundamentally violent and destabilizing. With slogans like “blue lives matter” or “police lives matter,” opponents of police accountability misrepresent Black Lives Matter as a movement that denies the value of police officers’ lives. This narrative, which claims that protests embolden violent criminals and destabilize cities, has come to be called the “Ferguson effect.” Despite record low numbers of murdered police officers, many politicians and pundits insist that the U.S. is in the throes of a “war on cops.” Although now widely debunked, the “Ferguson effect” narrative continues to gain broad acceptance, making it easier for White Americans to express antipathy toward protesters without acknowledging the injustices visited upon Black communities by the criminal justice system. In the context of an imagined war on police, it feels noble to call for civility first and foremost. Doing so makes the act of dismissing Black protest seem a sensible response, rather than a blatantly self-serving one. In the present moment, much as in the middle of the civil rights movement, White Americans have revealed a distaste not for protest in general, but for Black protest in particular. In the summer of 2015, two thirds of Whites expressed a belief that protest by Americans against governmental injustice makes the United States a better place. Less than half affirmed the same belief regarding protest by Black Americans against governmental injustice. While an increasing share of White Americans agree that “more needs to be done” to achieve equality for Black people, when confronted with more specific questions, these same respondents remain largely unwilling to acknowledge particular, concrete injustices. In another summer 2015 poll, 50 percent of Black respondents reported being treated unfairly by police due to their race, while only 3 percent of Whites reported such experiences. Perhaps as a result of this chasm, nearly 60 percent of Whites expressed belief that race plays no role in police officers’ decisions to use force, a view rejected by over 80 percent of Blacks. Perhaps even more glaring, less than 20 percent of Whites identified police violence as an “extremely” or “very serious” problem, compared to nearly 75 percent of Blacks. White Americans tend to acknowledge racial injustice in a vague, general sense, but they tend to reject proposed remedies, and to decry actions that most directly and visibly confront racial inequality. In this way, they echo the attitudes of 1961, when a majority of Whites claimed to agree with the Freedom Riders’ aims, but only 24% could bring themselves to approve of their tactics. We know you’re not free, they effectively shrugged to their Black contemporaries, but you can’t expect us to support a rapid, disruptive path toward equality. Of course, most White Americans eventually did align themselves with the victories of the civil rights movement. But it is all too easy to interpret these victories as an arc of consistent progress, a shameful past giving way to a more promising future. This narrative of inevitable progress downplays the White majority’s reluctance toward social change, in both the past and the present. By celebrating yesterday’s civil rights activists as heroes, Whites distance themselves from the segregationist villains of the past. This allows them to comfortably reject today’s protests, assuring themselves that their own ambivalence toward Black activism does not reflect the close-mindedness of a previous generation. To acknowledge the urgency of protest today would require dissolving this assurance, questioning the redemptive view of American history, and inspecting widespread assumptions of White racial innocence. It is little wonder, then, that so many White Americans still cannot accept without anxiety the basic claim that Black lives matter.